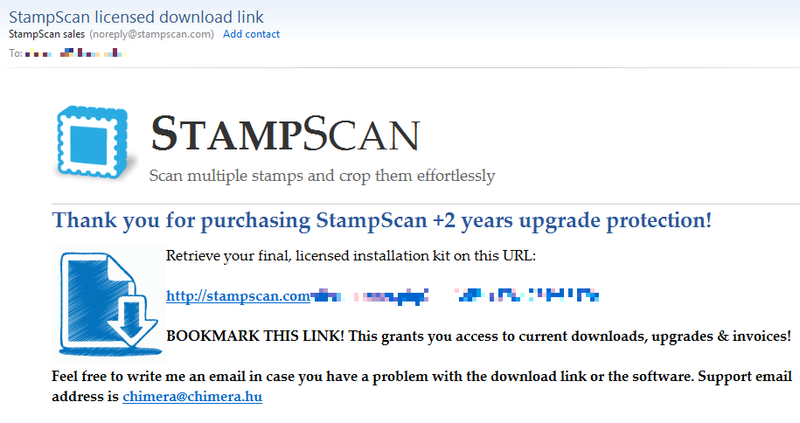 Buy stamp scanner software StampScan. Already registered? Recover your account here. StampScan offers a fast and effective method to scan your stamp collection. You can finally enumerate and archive them to your computer, to a CD or DVD. Present scanned images to your customers or fellow collectors. All licenses are per computer licenses: one license per computer is required. Automated instant delivery. You will receive a download link to the registered version in your email used for registration. Your contribution matters a lot. Here's why. Continued development of the product. Make stamp scanning even faster and easier with new features. We are a small business. Your purchase will help a family make ends meet. Alleviate poverty. Part of StampScan's revenue funds microloans in developing countries to help people help themselves. Join Kiva to make a difference. Alternative payment method. If you prefer not to use PayPal, please consider this one. May charge extra VAT in EU countries! * Download guarantee: indefinite free access to the purchased install kit and subsequent versions covered by upgrade protection (see below). ** Upgrade protection: by default, you can download all new versions (upgrades) for 30 days after purchase. This protection period can be extended by 1 year increments. Guarantee your access to future updates by choosing an extended upgrade period for your license. An automated email containing the link to your personalized Customer Care webpage will be sent out immediately upon purchase. Download and install the registered version to work without watermarks. Recover your account here if the registration email has been lost. Alternatively, you can contact us at this email address to recover your account.